O-kis's Photo Hanging Display for Wall Decor. It is a good item to display your photos/pictures. This product will certainly bring the beauty and emotion to your life, showing your fond memories, love, friendship, your journey, any pretty detail in your life. The product is composed of different accessories, which are made by different amazing materials. The specialty match of the brown natural wood, gold chain and transparent beads makes it much elegant and pretty, especially standing out when hung on the light color wall. This will certainly make you feel natural warmth. It can display your pretty photos/pictures anywhere, such as study, bedroom, living room, corridor or passage way. O-KIS is committed to product quality and 100% customer satisfaction guaranteed. Any questions, please contact us by e-mail. Design: Metope/Wall decoration. 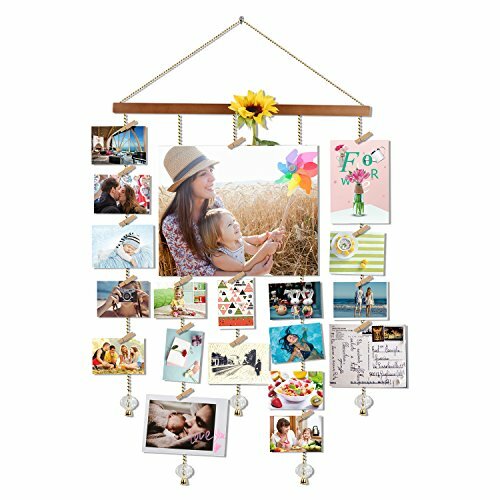 This product will certainly bring the beauty and emotion to your life, showing your fond memories, love, friendship, your journey, every pretty detail in your life. Function: Any size of photo could be displayed. No limit to the photo size within the product, like a jigsaw puzzle, which makes an experience of creation. Multiple combination: Various photos to be displayed with multiple combination so as to make your walls more eyeable and decorative. Product Assembly: Find a hook or use the attached screw, pin it to the wall and then hang it on. Photos are to be clamped to the wooden clips. This product can be hung to the study, Bedroom, Living room, Corridor or passage way. Sales Support: Product quality and 100% consumer satisfaction guaranteed. Any advice on our product or service, Welcome to suggest. If you have any questions about this product by O-KIS, contact us by completing and submitting the form below. If you are looking for a specif part number, please include it with your message.